هدف کلی این پژوهش، بررسی نیت و رفتار حفاظت از آب توسط کشاورزان در شهرستان الشتر از طریق مبنا قرار دادن سرمایه اجتماعی بود. جامعه‌ی آماری این پژوهش، کشاورزان شهرستان الشتر به تعداد 6000 نفر بودند که بر اساس نمونه‌گیری چند مرحله‌ای تصادفی طبقه‌ای انتخاب گردیدند و بر اساس جدول کرجسی و مورگان نمونه‌ای 360 نفری از آنان برای تحقیق انتخاب شدند. تحلیل رگرسیون سرمایه اجتماعی مؤثر بر نیت و رفتار حفاظت از آب کشاورزی نشان داد، متغیرهای اعتماد به نهادهای اجتماعی، ارتباطات برون محلی و ارزش زندگی عوامل مرتبط در رابطه با پیش بینی نیت حفاظت از آب کشاورزان می‌باشند، این متغیرها در مجموع قادرند، 40% از نیت حفاظت از آب را تبیین کنند. از طرفی دو متغیر تحمل تنوع و ارتباطات برون محلی قادرند تغییر در متغیر رفتار حفاظت از آب کشاورزان را در سطح معنی‌داری پیش‌بینی ‌نمایند، این متغیرها در مجموع قادرند 41% از رفتار حفاظت از آب کشاورزان را پیش‌بینی نماید. در نهایت، بر اساس نتایج تحقیق پیشنهاداتی جهت مصرف بهتر آب توسط کشاورزان ارائه گردید. 2Assistant Professors, Department of Agriculture Extension and Education, Khuzestan Ramin Agriculture and Natural Resources University, Iran. The goal of this study is to investigate farmers’ intentions and behavior regarding water conservation in the Aleshtar County based on social capital. The statistical population in this study consisted of 6000 farmers living in the Aleshtar county A sample of 360 farmers were selected from this population based on Krejcie and Morgan’s Table. Sampling was done by using the stratified random sampling method. Regression analysis of social factors indicated that trust in public institutions, external communication and value of life are the most important factors to predict the intention for agricultural water conservation. The results revealed that these variables on the whole could predict 40 % of the variations in intentions for agricultural water conservation. Furthermore, tolerance of variation and external communications were significantly useful to predict farmers’ water conservation behavior as well. Totally, if these variables are used, we can predict 41% of variations in farmers’ water conservational behavior. Finally, based on the research results, suggestions for better use of water by farmers have been provided. سرمد، ز.، بازرگان، ع. و حجازی، ا. 1379. روش­های تحقیق در علوم رفتاری. تهران: انتشارات آگاه، 151- 149. Ajzen, I. 2003. Constructing a TPB questionnaire: Conceptual and methodological considerations. Retrieved April 14, 2003, from University of Massachusetts, Department of Psychology, Available at: http://wwwunix. oit.umass.edu/_aizen, Visited: 2015.12.01. Ajzen, I. 2006. Constructing a TPB questionnaire: Conceptual and methodological considerations. Retrieved May 26, 2008, from University of Massachusetts, Icek Ajzen Theory of Planned Behavior, Available at: http://people.umass.edu/aizen/tpb.html, Visited: 2015.12.01. Agurto Adrianzen, M. 2014. Social capital and improved stoves usage decisions in the northern peruvian andes. World Development, 54: 1-17. Ballet, J., Sirven, N. and Requiers-Desjardins, M. 2007. Social capital and natural resource management a critical perspective. The Journal of Environment & Development, 16(4): 355-374. Coleman, J. S. 2009. Social capital in the creation of human capital. American journal of sociology, 94: 95-120. Flora, C. B. 2004. Social aspects of small water systems. Journal of contemporary water research & education, 128(1): 6-12. Harpham, T., Grant, E. and Rodriguez, C. 2004. Mental health and social capital in Cali, Colombia. Social science & medicine, 58(11): 2267-2277. Holt, L. 2008. Embodied social capital and geographic perspectives: performing the habitus. Progress in Human Geography, 32(2): 227-246. Isham, J. 2002. The effect of social capital on fertilizer adoption: Evidence from rural Tanzania. Journal of African Economies, 11(1): 39-60. Jones, N., Evangelinos, K., Gaganis, P. and Polyzou, E. 2011. Citizens’ perceptions on water conservation policies and the role of social capital. Water resources management, 25(2): 509-522. Lopez-Gunn, E. 2012. Groundwater governance and social capital. Geoforum, 43(6): 1140-1151. Michelini, J. J. 2013. Small farmers and social capital in development projects: Lessons from failures in Argentina's rural periphery. Journal of Rural Studies, 30: 99-109. Miller, E. and Buys, L. 2004. Is Generation X the new Civic Generation? An exploratory analysis of social capital, environmental attitudes and behaviors in an Australian community. Miller, E., Buys, L., Barnett, K. R. and David, N. 2006. Social capital, environmental and water sustainability: essential ingredients prompting community action on conservation challenges?. International Journal of Environmental, Cultural, Economic and Social Sustainability, 2 (2): 1-10. Nakagawa, Y. and Shaw, R. 2004. Social capital: A missing link to disaster recovery. International Journal of Mass Emergencies and Disasters, 22(1): 5-34. Onyx, J. and Bullen, P. 2000. Measuring social capital in five communities. The journal of applied behavioral science, 36(1): 23-42. Onyx, J., Osburn, L. and Bullen, P. 2004. Response to the environment: social capital and sustainability. Australasian Journal of Environmental Management, 11(3): 212-219. Onyx, J., Wood, C., Bullen, P. and Osburn, L. 2005. Social capital: A rural youth perspective. Youth Studies Australia, 24(4): 21. Polyzou, E., Jones, N., Evangelinos, K. I. and Halvadakis, C. P. 2011. Willingness to pay for drinking water quality improvement and the influence of social capital. The Journal of Socio-Economics, 40(1): 74-80. Pretty, J. and Ward, H. 2001. Social capital and the environment. World development, 29(2): 209-227. Roudi-Fahimi, F., Creel, L. and De Souza, R. M. 2002. Finding the balance: Population and water scarcity in the Middle East and North Africa. Population Reference Bureau Policy Brief. Stratford, E. and Davidson, J. 2002. Capital assets and intercultural borderlands: socio-cultural challenges for natural resource management. Journal of Environmental Management, 66(4): 429-440. Tumbo, S. D., Mutabazi, K. D., Masuki, K. F. G., Rwehumbiza, F. B., Mahoo, H. F., Nindi, S. J. and Mowo, J. G. 2013. Social capital and diffusion of water system innovations in the Makanya watershed, Tanzania. The Journal of Socio-Economics, 43: 24-36. Van Rijn, F., Bulte, E. and Adekunle, A. 2012. Social capital and agricultural innovation in Sub-Saharan Africa. Agricultural Systems, 108: 112-122. Wauters, E., Bielders, C., Poesen, J., Govers, G. and Mathijs, E. (2010). Adoption of soil conservation practices in Belgium: An examination of the theory of planned behavior in the agri-environmental domain. Land Use Policy, 27(1): 86-94. Yang, H., Reichert, P., Abbaspour, K. C. and Zehnder, A. J. 2003. A water resources threshold and its implications for food security. Environmental science & technology, 37(14): 3048-3054. Yazdanpanah, M., Rahimi Feyzabad, F., Forouzani, M., Mohammadzadeh, S., & Burton, R. J. (2015). Predicting farmers’ water conservation goals and behavior in Iran: A test of social cognitive theory. Land Use Policy, 47: 401-407. Yazdanpanah, M., Hayati, D., Hochrainer-Stigler, S. and Zamani, G. H. 2014. 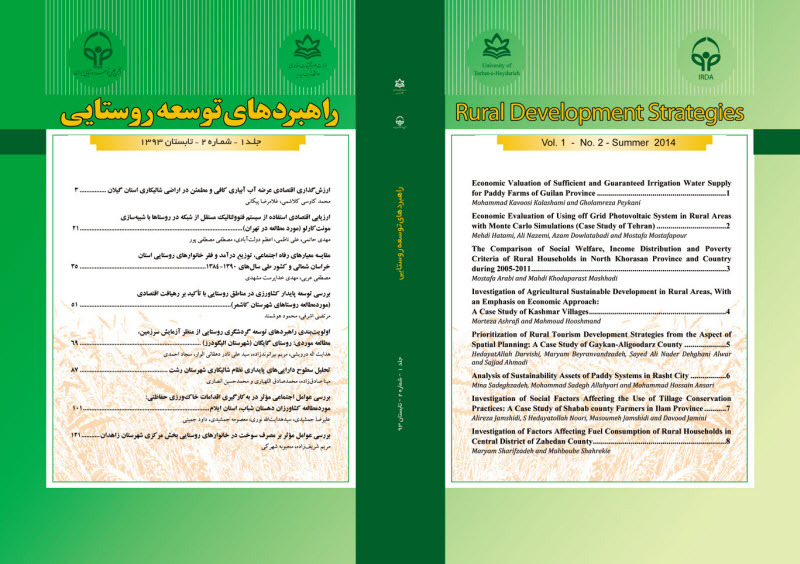 Understanding farmers' intention and behavior regarding water conservation in the Middle-East and North Africa: A case study in Iran. Journal of environmental management, 135: 63-72. Yazdanpanah, M., Thompson, M., Hayati, D. and Zamani, G. H. 2013. A new enemy at the gate: Tackling Iran’s water super-crisis by way of a transition from government to governance. Progress in Development Studies, 13(3): 177-194. Yip, W., Subramanian, S. V., Mitchell, A. D., Lee, D. T., Wang, J. and Kawachi, I. 2007. Does social capital enhance health and well-being? Evidence from rural China. Social science & medicine, 64(1): 35-49.